This large (460 pages) and impressive book will appeal to those interested in architecture and also in the important Polemaic Period and beyond into the Byzantine era, a time span of one thousand years. The author examines the interaction between the imported Greek styles of architecture and the native Egyptian traditions, which the Ptolemies revived and adapted. 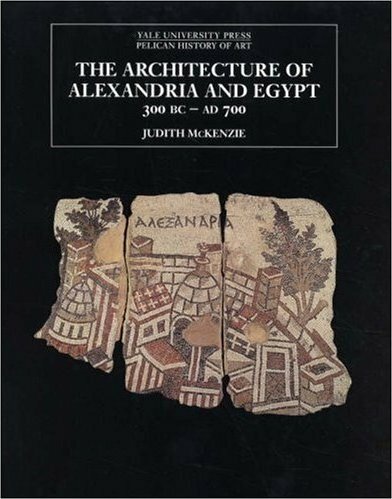 Whilst the main focus of this book is the city of Alexandria, where excavations on land and underwater have revealed much about its history and architecture, other important remains elsewhere in Egypt are included, such as many well preserved temples like Edfu and Philae, and also contemporary buildings from elsewhere in the Mediterranean world. The first part of the book looks at how the ancient city of Alexandria was virtually lost by destruction before 1800 AD. We see, through the use of early drawings and engravings of travellers to Egypt, how the city looked then, but this period was followed by even more destruction in the nineteenth century. Only since the twentieth century has archaeology revealed the city’s secrets and made it possible to reconstruct the city’s plan, water system, city walls and cemeteries, and its great harbour. Part Two looks at the Ptolemaic Period in some detail, in chronological order from Alexander the Great through to the reign of Cleopatra VII and the Roman conquest. Chapters look at the classical styles of architecture and at the traditional Egyptian styles. Part Three looks at the Roman Period in Alexandria and at the towns of Roman Egypt; Part Four looks at the Byzantine Period and at the influences of Alexandria on Byzantine architecture outside Egypt, and also on Byzantine and early Islamic Art. This book is crammed full of superb photos. of the sites, of maps, plans, architectural drawings and reconstructions, all of which give a clear view of the scale and grandeur of many of the towns and cities and the buildings they contained. Alexandria was one of the most important cities in the ancient world; it is clear that it directly influenced other cultures and that the city was a major source of architectural and artistic innovation with a remarkable legacy in the Mediterranean world. This book should be an absolute ‘must-read’ for someone visiting Alexandria, but also for the visitor to other parts of Egypt: the great Ptolemaic temples of course, but also the many Coptic churches, monasteries and even the early mosques, which reused building material from earlier buildings or were sometimes built in, on or around more ancient structures. ISBN 0 300 11555 5. Hardback, price £55. This is part of a series of military titles by this publisher, a number of which have featured ancient Egypt. In this small, but information-packed volume, the author looks at all aspects of the lives of soldiers. 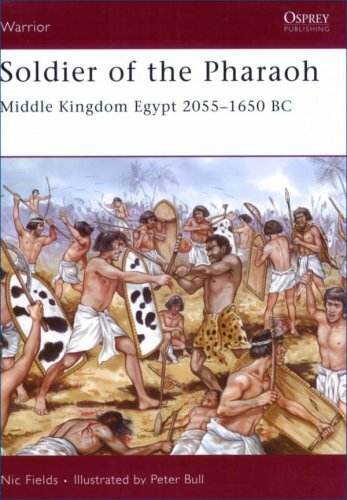 After an introductory chapter on the Middle Kingdom, further chapters look at the recruitment of soldiers, at their weapons and equipment, at battles, medical treatment, life in garrisons on and beyond the frontiers of Egypt and at religious beliefs. The book is illustrated with many photos. of reliefs and related objects. Many of these are in colour, although a few of the black-and-white images are of poor quality. One of the strengths of this book, and indeed other Osprey titles, is the use of artists to recreate scenes, always helpful when surviving visual information consists of objects scattered in museum collections. The paintings, by artist Peter Bull, appear to be well researched and based on objects and tomb paintings. They really bring the soldier’s lot to life in a way that individual objects cannot always do. As an introduction to the subject, this book is excellent and there is a useful glossary and list of books for further reading. Published by Osprey Publishing, 2007. ISBN 978 1 84603 106 9. Paperback, price £11.99. This is the official catalogue, available in English, of the exhibition of the same name that was on show in Vienna earlier this year. The exhibition featured many objects from the Tomb of Tutankhamun, but also items relating to earlier and later periods including many key pieces of sculpture and well know artifacts. This book is more than just a catalogue, for it contains a number of introductory chapters by other Egyptologists – David O’Connor, Betsy M. Bryan and Donald Redford –which cover the history of the period and set the objects on display in their context. Exhibition catalogues are always well worth buying and this one is no exception. All the objects are superbly illustrated, with a detailed description. Many of the objects will be familiar but there are others that will be new to many readers and that may not have been noticed by them in their usual home, the Egyptian Museum in Cairo. If you missed the exhibition (as I did) then this book is a more-than-adequate substitute and one that will be of both interest and practical use for reference in the future. Published by National Geographic, 2008. ISBN 978 1 4262 0264 3. Hardback, price 54 Euros. Last year, the Egypt Exploration Society celebrated its 125th anniversary, having been founded (as the Egypt Exploration Fund [EEF]) in 1882. The Society still undertakes important work in Egypt today, but in its early years it excavated and published its findings on many of the most significant sites in Egypt. This book covers the period from the formation of the Society up to the start of the First World War in 1914. 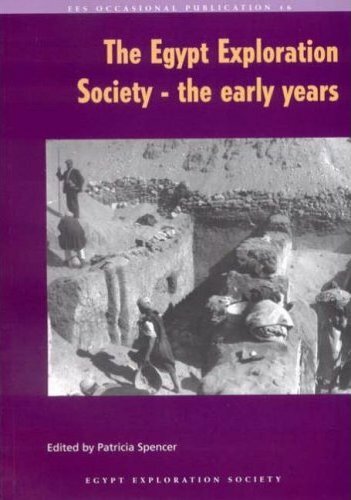 Many Egyptologists have contributed to this volume, each choosing a site or aspect of the work of the Society: Neal Spencer, Naville at Bubastis and other Sites; Patricia Spencer, Petrie in the Delta; Christopher Naunton, The Archaeological Survey; T.G.H. James, Deir el Bahari; Barry Kemp, Abydos; Joanne Rowland El Amrah, el Mahasna, Hu and Abadiyeh; Dominic Rathbone, Grenfell and Hunt at Oxyrhynchus and in the Fayum; and Andrew Bednarski, Deshasheh, Dendereh and Balabish. The book relies heavily on the EES’s great archive of photographs taken at the various sites and each chapter includes a selection of images, with the text and history/description of the sites linked to these images. The text is well written and describes the scenes and details the history of the work at the sites and the scope and nature of the discoveries made. It is the photos. that really ‘make’ this book, for it is truly fascinating to have a glimpse into Egypt’s archaeological past and see the sites as they were first revealed. Many of the key objects we see in museums today were found at these sites, and here we see them at the time of their discovery. All too often, statues in museums are seen as works of art alone and it is remarkable and important to see these images, which put the objects back into their architectural, geographical and archaeological context. This is all the more important, as all too often objects discovered at one site have now been scattered through different collections around the world. I found it really interesting to see the first image taken of the famous ivory statue of Khufu found by Petrie at Abydos; an image of a granite head of Senusret III also from Abydos, as it was found; fallen columns at Herakleopolis Magna and shattered statues at Bubastis. The Khufu statue is now in the Egyptian Museum in Cairo, the Senusret head and one of the columns are now in the British Museum and some of the Bubastis statues shown are now in the Louvre in Paris. Archaeology is a destructive process, more so perhaps in the past when so many objects were removed from the sites, so the EES’s photo. archive is, and will always remain, hugely important. This book provides just a glimpse into this archive and at the important and large-scale, hard, dirty and probably dangerous work of the EES in the early years. It reveals the life and times of the early archaeologists, digging at what were at the time almost virgin archaeological sites and one can imagine the excitement at the discoveries made. Most importantly, to me at least, it re-connects finds with sites. One added bonus in this excellent book is the inclusion of a number of fine colour reproductions of watercolour paintings made by the young Howard Carter at several sites in Egypt. Carter began his Egyptological career with the EEF. ISBN 978 0 85698 185 2. Paperback, price £22. This is a collection of papers presented at meetings of the Theban Workshop, a forum organised jointly by the John Hopkins University and the Oriental Institute of the University of Chicago. The papers were given by many eminent Egyptologists and experts in their field, and this publication means that their work and findings are made available to a much wider audience. The contents are divided in to two sections. Part One, Divine Temples, Ritual Landscapes, has chapters on: Egyptology and the Evaluation of the Sites of Western Thebes, Mohammed el Bialy; Thebes: Origins of a Ritual Landscape, by Maritna Ullmann; Archaeological and Textual Evidence for the function of the ‘Botanical Garden’ of Karnak in the Initiation Ritual, by Dimitru Laboury; Pharaonic Building Inscriptions and Temple Decoration, by Silke Grallert; Veils, Votives and Marginalia: the Use of Sacred Space at Karnak and Luxor, by Peter Brand; and The Terminology of Sacred Space in Ptolemaic Inscriptions from Thebes, by J. Brett McClain. 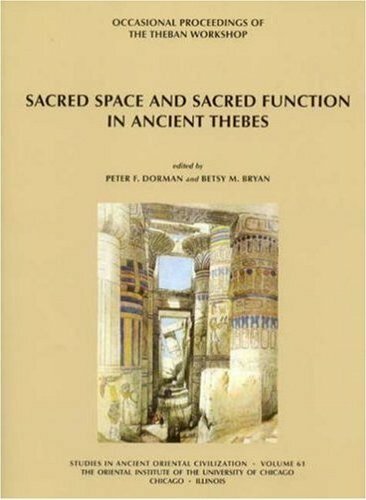 The chapters in Part Two: Theban Tombs and Necropoleis, are: Intersection of Ritual Space and Ritual Representation: Pyramid Texts in 18th Dynasty Theban Tombs, by Harold Hays and William Schenck; Chamber Ja in Royal Tombs in the Valley of the Kings, by Catharine H. Roehrig; Use, Reuse and Abuse of ‘Sacred Space’: Observations from Dra Abu al Naga, by Boyo G. Ockinga; Christian Use of Pharaonic Space in Western Thebes, by Heike Behlmer; and Feasts, Fertility and Fear: Qurnawi Spirituality in the Ancient Theban Landscape, by Kees van der Spek. The subjects covered may be a little too specialist for the general reader but will be of interest to anyone studying the area of ancient Thebes in particular and they all make for interesting and enlightening reading. Published by The University of Chicago, 2007. ISBN 978 1 885923 46 2. Paperback, price £24.99. One only has to look at the sale catalogues of the major auction houses to appreciate the number of ancient Egyptian objects that are available; over the last two hundred years many private collections have been formed, and indeed are still being formed today, as objects, which were brought out of Egypt perfectly legally, change hands and find new custodians for a generation or two perhaps. It is easy to imagine private collections being just that, very private, with no one but the owners seeing them, so it is commendable when those who currently own such objects allow them to be studied and published, so that their existence is known and they can be studied by others. This book looks specifically at shabtis, and is what can only be described as a sumptuous and remarkable volume, one that has perhaps set a standard of publication others might find difficult to follow. The shabtis featured in this volume are all of the highest quality, and examples are shown dating from the Middle Kingdom onwards. After a good introduction on the purpose of shabtis, the figures are included in chronological order. Each shabti is fully described along with a history or provenance, where known (showing where the figure has been since it left Egypt) and a note of any publications that featured the figure. The inscribed texts are all shown as hieroglyphs, a transliteration and a translation. Each shabti is illustrated in colour, and this is where the quality of this publication really shows: the photos. of each shabti are reproduced at their actual size (I am not aware of other publications that have done this) and the figure is ‘cut out’ and shown on the white background of the page. Another feature I have not seen in any book before is that, whereas the page itself has a matt finish, the shabti photographs are in high gloss, which really makes them stand out. In addition, each figure is shown in several views, front back, sides, and sometimes top. The photos. are truly excellent (the photography was by Tom Bangbala) and are sharp, bright and clear, so that the inscriptions, either inscribed or painted, can easily be seen and read. The side views of the figures are important, for all too often the text wraps around the sides of the figures and would be partly hidden in a front view only. 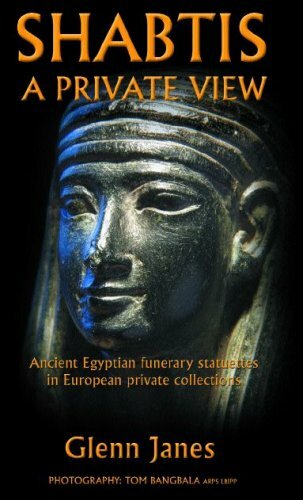 Whilst this book will probably be best appreciated by those really keen on shabtis, the individual items are well up to museum quality and are some of the best examples of shabti figures to be seen. If you want a good book on the subject, with more information than you will find anywhere else, and a superbly-produced book at that, then this is one to add to your collection and enjoy. A special added bonus is a CD-ROM of all the images, where the individual shabtis can be zoomed in on; several can be full rotated. ISBN 2 9516758 2 8. Hardback, price 90 euros. 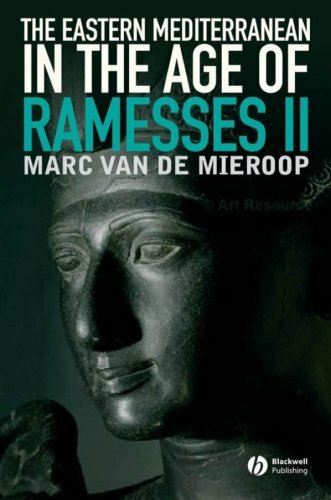 The reign of Rameses II is probably well known to anyone with an interest in ancient Egypt and there have been many publications on his life and times and in particular on his relations with Egypt’s neighbouring countries. This is a time when, around the Eastern Mediterranean, powerful states jointly shaped the history, culture and society of the region, through military and peaceful means. By looking at the history of Egypt in isolation, one literally sees only half of the picture and often from the Egyptian point of view; the ‘facts’ are biased and distorted. It is only by studying the full history of this part of the world that the complex relationships can really be appreciated, and an understanding gained of how Egypt fitted into the larger picture. The author sets the scene of the world around 1279 BC and introduces us to the Primary and Secondary Actors in the story. A large proportion of the book looks in some detail at political Organisation and Social Structure and at Diplomacy and War, areas which one might expect to find in a book like this, but additional chapters look at less obvious areas, but ones that had an international bearing nonetheless. These include Food and Drink, Aspects of the Economy, Textiles, Metals and Trade, all of which add greatly to the complex story and which show how neighbouring countries were actually bound together by common interests and values, whilst competing constantly with one another. The outcome of this competition was often military conflict, as happened in the reign of Rameses, but it was the triumph of diplomacy and alliance that won the day and resulted in a more stable Middle East for many years. This book is relatively sparsely illustrated in black-and-white. A useful appendix includes king lists for Egypt’s neighbours, which are very useful for anyone not over-familiar with the history of these countries. A large and comprehensive bibliography is also included. Published by Blackwell Publishing Ltd., 2007. ISBN 978 1405 160698. Hardback, price £55. Ancient Egyptian art expressed the ancient Egyptians’ view of the world and their religious and funerary beliefs. As the author shows, to understand the culture of ancient Egypt, one needs to understand the art and also the many and varied reasons why the art was created in the first place. 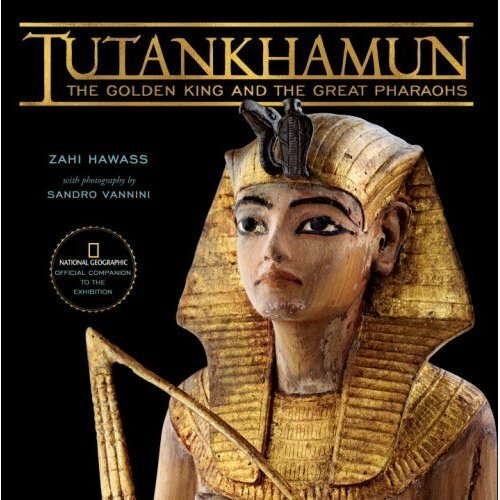 This book is illustrated with many remarkable objects from the collection of the British Museum, but other key objects are also included from Egypt and collections in the United States and Europe, as well as photographs of many tombs and temples in Egypt. The author looks at the different functions of artistic products from temples, tombs and everyday life and demonstrates how it is important to understand them in the context for which they were originally designed. 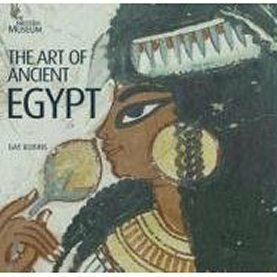 Egyptian art is always seen as being very conservative, but this book shows how and why the artistic styles, composition and subject matter did change over the three thousand year time-span of the ancient Egyptian civilisation. This book is well written and illustrated. It gives a clear introduction to the subject and one which will be ideal reading for anyone new to the subject. 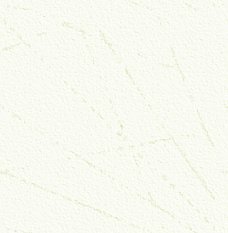 There is a large and comprehensive bibliography for those who wish to read more on the subject or aspects of it in more detail. ISBN 978 07141 1982 3. Paperback, price £16.99.